It is Not: all about videos and watching them for homework, a replacement for the teacher, a one size fits all approach. It is: a way to increase interaction with your students, a path to personalized learning for students, an environment where students become responsible for their learning, a way to teach students to become better learners ... It brings the interactive work into the classroom and it brings gathering the knowledge outside the classroom ... It's in fact rearranging the activities we do inside and outside the classroom. - in fact all activities where their peers and teachers have a function and add value. Was lastig om hier bruikbare aantekeningen van te maken. 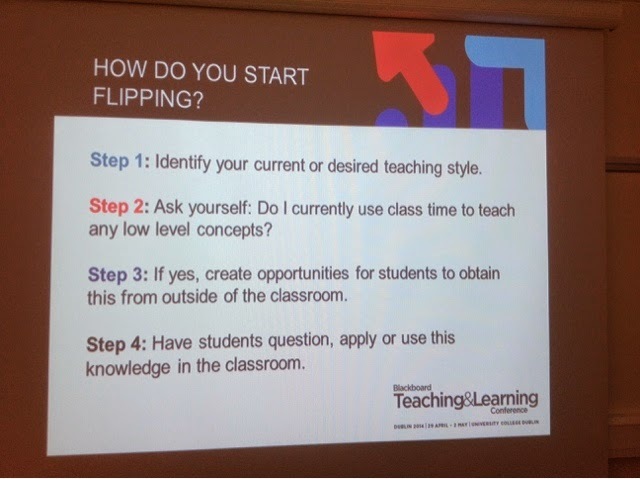 Hadden als groepje leuk voorbeeld uitgewerkt over het trainen van docenten in het (geavanceerd) toepassen van Bb (in a Flipped Classroom setting).